To take a quick screenshot and share it right away, press Ctrl + Shift + 2 and then select the screen area you want to capture. The screenshot is automatically saved in the Screenshots folder on your Disk. The link to the screenshot is copied to the clipboard. To make a screenshot and then modify it in the editor, press Ctrl + Shift + 1 and select the area. In the editor, you can crop the screenshot, insert arrows, simple geometric shapes or text. When the screenshot is ready, you can Save, print or share it. Click the Share button. 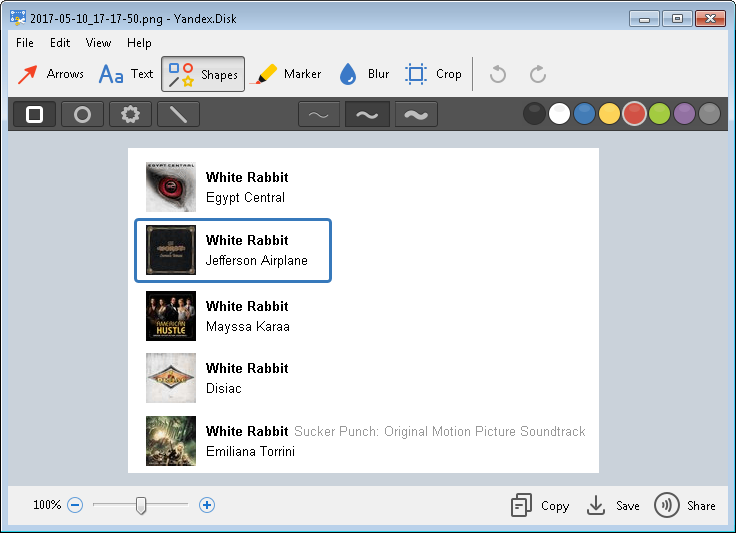 The screenshot is saved to Yandex.Disk and the public link to it is copied to clipboard.